Summary of today’s show: With less than a week to go before Christmas, Scot Landry and Fr. Matt Williams discuss with Michael Lavigne and Stephen Colella the Advent and Christmas traditions they grew up with and those they have acquired that help them and their families prepare for the beautiful celebration of the Birth of Christ. The panel also discusses why midnight Mass on Christmas Eve might be a new habit some will want to acquire and Our Sunday Visitor’s list of 30 ways to get the most out of Advent and Christmas. 1st segment: Scot Landry welcomes everyone to the show and notes that we are less than one week from Christmas, and we are preparing to commemorate the Nativity. He welcomed Fr. Matt Williams back to the show and asked if he’s recovered from the five nights of the God of This City Tour last week. Fr. Matt said it was so worth it. He said many members of the team worked all day then spent their evenings with the tour and didn’t get home until after midnight. It was the fourth tour since they started. Fr. Matt said what will remain with him will be the evening at the cathedral because it’s the mother church and the cardinal was there along with 700 young people. Also the company that did the sound and lighting for them this year brought in so much more for the money that they were paid or that Lift could afford. The visual images alone added to the praising the Lord will remain. Mother Olga did a great job on Friday in her reflections. But it will also be remembered on a sad note because the tragedy in Newtown, Connecticut, occurred that morning. They wondered how they could incorporate pray for that event during the evening. The cardinal was the one to address the matter and prayed for the families. The very next song called “Jesus Messiah” was perfect for the moment because it is an Advent song and it speaks of Jesus as our only hope. In the midst of tragedy and loss to whom else do we turn by Jesus? Today we’ll be talking about family traditions for Advent that make the season more meaningful. 2nd segment: Scot and Fr. 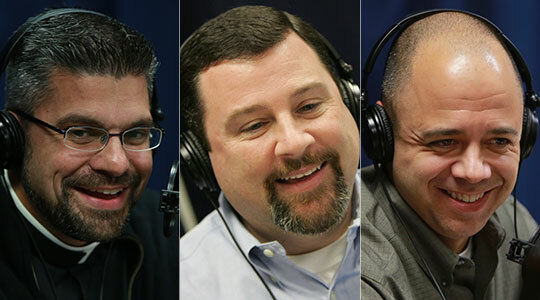 Matt welcome back Michael Lavigne and Stephen Colella to the show. As we move through Advent, we want to make the Christmas experience as rich as we can for our friends and family. Stephen said he works with families and youth ministers and he helps come up with tools to help them form their young people. They speak of the ACES of learning acronym. They want Active learning, rather than passive. Keep the activity in the faith active. For example, if you’re reading the Christmas story, let the children read it themselves or take certain pieces of it. C stands for Communal. There is value in communal learning. For example, when lighting the Advent candle with the whole family, it becomes communal. We learn differently as a team than we do one on one. E is for Experiential. This means it’s hands-on. There are traditions like making certain kinds of food. Making a traditional food together and sharing stories of the family’s heritage. S is for Senses and we use all our senses. There are the colors of Advent and if we decorate the house in purple, for example, it sets a tone. When you can tie all four together it goes a long way. For example, a family puts the nativity set out all together. After dinner every night, they reflect on how they have welcomed Christ for others into the world and for each act they put a piece of straw into the manger. Stephen said in his own family, he recalls all the cooking that went on leading into Christmas day. They never went out, but people were invited over and it was a buffet all day long for friends, family, and those who had no place else to go. Scot asked Michael about some of his favorite memories. He said his wife is Greek and Italian and food is important to her too. Michael said at the beginning of Advent they went to a parish family Advent wreath-making. His instinct as a dad to jump in and do everything himself. But his wife jumps in and lets each child take part and explains to them what everything means. Then they use the Advent wreath during the season. Every night, they do bedtime prayers in the living room with the Advent wreath, lighting the candle, and singing a verse of O Come O Come Emmanuel. Each night a different child gets to blow out the candle. He said they’re very intentional during Advent. They spread out the preparations throughout Advent. Last week, they put up the tree and decorated it and did the blessing in the tree. They incorporate prayer into everything they do. Fr. Matt said for him growing up, they always had the fake Christmas tree. Scot outed himself as a fake tree person. Fr. Matt said having grown up with it, he appreciates it too. Stephen said he gets a real tree and it smells great. He loves having to water and nurture it. Michael lived in Maine for four years and he cut his own tree down. He would go to a tree farm, not just going into the forest on his own. Fr. Matt said his family would put the tree together and put up the nativity. The Christmas tree was always connected with the nativity set. It was an heirloom from his maternal grandmother. He remembers they never put the baby Jesus in the manger until Christmas and the three kings were kept away from the creche. Later, the family rosary became part of the ritual and they would pray and add straw to the manger. Later in his high school years, they prayed the St. Andrew’s Christmas novena that began on November 30 until Christmas Day. It became a pious tradition seeking an intercessory prayer but also calling to mind that beautiful moment of the Lord’s birth. It is prayed 15 times each day. Fr. Matt said in his family, his dad would lead them in the prayer 15 times after the family rosary. When he was at St. Mary’s in Dedham, Fr. Matt said they did a live nativity play. The middle school kids were the active participants and they rented live animals. After the 9:30am Mass, everyone was invited to the parking lot and the kids dramatized the Christmas story and sang Christmas carols. Afterward, they would have hot chocolate in the rectory. Stephen said his family would go to midnight Mass. Scot noted that tradition was more popular in the past than it is today. Stephen said it became a family tradition and his mother wanted to welcome Jesus first before they welcomed Santa. Michael said they went to midnight Mass too and then the family would open Christmas presents, going to bed after that. Fr. Matt said they didn’t go to the midnight Mass, but to the vigil Mass, and go out to Chinese food afterward. Later as their faith took a more active role in their family’s life, then it was the midnight Mass as well. Even the readings reflect that it’s the midnight celebration that is most significant. The readings at the Masses before are still anticipatory. It is the Mass when so many of the faithful, those who are the core of the parish are together and all stops are pulled out. Scot said he’s never been to a midnight Mass, although he’s watched the midnight Mass from St. Peter’s. But now his brother, Fr. Roger Landry, has been writing about the midnight Mass in his new parish’s bulletin about the importance of the midnight Mass and Scot read at length from Fr. Roger’s bulletin. I am sure many of you are making plans for how you’re going to spend Christmas Eve and Christmas Day. I wanted to give you the Mass schedule. We’ll have a vigil Mass at 4 pm, the Midnight Mass at Midnight, and we’ll have a 10:30 Mass on Christmas Day. Please note that there will be no 8:30 am or 5 pm Mass on Christmas, as there normally is on Sunday. I would urge all of you who can to make the extra effort to come to the Mass at Midnight. I wrote in the bulletin a few weeks ago that there is something beautifully symbolic about the tradition of Midnight Mass. People who ordinarily never go out late at night and are often at that hour dressed in pajamas and sleeping soundly adjust their sleep schedules to get up, put on their best clothes and head out alert to their parish churches. The Christmas midnight Mass is the antithesis of the growing tendency to try to make the practice of the faith convenient and easy. It’s a bulwark against the propensity to fit the celebration of Christmas and the worship of God into our crowded life; it is, rather, an annual reminder that we are called to make our lives revolve around the mysteries of faith and that those mysterious realities are worth changing sleep patterns and inconveniencing ourselves. The annual tradition of Midnight Mass reinforces is an outward sign that we are awake and alert for the coming of the Lord and so excited for his arrival that we are willing to sacrifice everything else to greet him with joy and love as soon as he arrives. It is a public and personal reminder that we prioritize Christ over sleep, convenience, presents, family members, and everything else. In short, it manifests that God is God in our lives, that he is our highest priority, and that we would rather postpone everything else in life than delay giving him the response of loving adoration he deserves. Even for those who may struggle to live with this type of Christian receptivity and response throughout the year, it is at least an annual occasion to put things back in their proper order and restore God and our relationship with him to their proper places. The real meaning of Christmas, Pope Benedict said a few years ago, is that “God has set out towards us. Left to ourselves we could not reach him. The path is too much for our strength. But God has come down. He comes towards us. He has traveled the longer part of the journey. Now he invites us: ‘Come and see how much I love you. Come and see that I am here.” That is an invitation worth staying up for, worth receiving, wholeheartedly, worth journeying whatever distances with haste to correspond, and worth placing before all other things. So I’d ask you, even if you haven’t come to Midnight Mass for many years, to get up or stay up for God, to be as anxious to celebrate with Him as any child would want to get up in the middle of the night to see what Santa Claus may have left. It’s also a beautiful practice for Catholics to attend more than one Mass on Christmas, just like they will often attend more than one Christmas party. Scot said it’s making him re-think whether they should find a midnight Mass this year. It calls him not to do the minimum, but to find out what the maximum we can do in our faith. Stephen recalled attending midnight Mass at St. Peter’s in Rome one year and the sense of peace he experienced leaving the basilica this year. He admitted this column gets him to rethink his plans as well. Michael said growing up there wasn’t a vigil Mass, but they put emphasis on the midnight Mass. The pastor put votives around the church property. Michael said it’s tough to wake up your kids and go to midnight Mass, so for now they go Christmas morning, but they look forward to doing it again in the future. Scot said his parish, St. Agnes in Arlington, has 10 Masses scheduled for Christmas, 6 for the vigil and 4 on Christmas Day, including a 5pm on Christmas Day. Scot said he’s always gone to Mass on Christmas Day even if he’s gone the night before, but he’s sure that two-thirds of everyone in his parish is going to the Christmas Eve Masses as a convenience. What does it say that we opt for convenience. He said the introduction of the Saturday vigil Mass 50 years ago was intended to aid those who have to go then, but now it’s one of the biggest Masses so people don’t have to get up Sunday morning. Stephen recalled how many people around the world are grateful just to be able to go to Mass at all, whenever it’s available. We should also be grateful for our priests who do so much work on these days. He wins Pray, Hope, and Don’t Worry: True Stories of Padre Pio Book II by Diane Allen. Communicate. Talk with family members about what traditions to keep and simplify others. Take a prayer nap. Imagine you’re resting in the arms of the Lord. Stephen said it is a season of prayer and penitence so that’s how they adjust the attitude. They also send care packages for Advent to nieces and nephews that include activity books, charity boxes for tithing, candy, Christian pictures, and the like. Michael said the idea of not comparing self to others is important. It’s easy to get caught up in that rather than be appreciative of who we are and what we have, especially modeling it for children. Fr. Matt said curbing excessive gift giving makes him think of a time when he was 21 and had done some missionary work in Bosnia. Coming back after seeing these people who had been ravaged by civil war and blessed just to be together, he had Christmas gifts up to his ears and he knew he didn’t need it. In his family, they’ve reduced the gift giving to a secret Santa. They now make a family donation to My Brother’s Keeper. That ties to #12. Stephen said you can give a gift on the Feast of St. Nicholas or give only three gifts or open one gift per day of the 12 days of Christmas. They also gave the things that they need. Michael said last Saturday they took the kids to see the lights at the LaSalette shrine and then went to the sacrament of reconciliation. He said Advent is also a time to slow down. All these things on the list make you more patient, more prepared to celebrate Christ’s birthday. Fr. Matt said he loves the idea of meditating on the nativity scene. An hour before celebrating the midnight Mass, he prays before the nativity he keeps in his room. There’s also something beautiful about going to daily Mass and praying the Liturgy of the Hours. As you pray within the Church’s calendar, the prayers o beautifully communicate the season we’re in. they help us to slow down and do many of the things we saw on this list. Stephen said they get together with a family on Christmas Eve Eve to read the Christmas story, which makes sure they are done with preparations 48 hours before.